Image 1. Damn Cool Poker. Trebax Innovations has a product called DAMN SMALL POKER (DSP) which allows you to put a little interactive banner on your site. 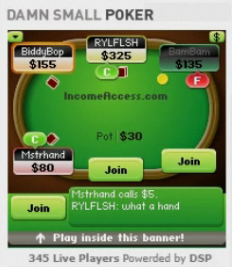 The banner lets visitors play poker right on the page just having to give away their e-mail address. At the end when the banner they promote a real poker site with sign up offers. I see this is as another way of getting people to play where they want. Just imagine PokerStars, Full Tilt Poker and all the rest of the poker sites having a small version of their for fun client that you can put on your own site. It would be really cool. In the future we will see more ways for players to play poker not just in the download client or poker portal (see my blog post about iPhone).